John Deere tin, small lunchbox with handle. 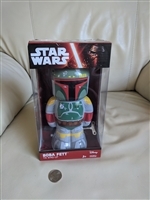 TINBOX COMPANY. John Deere small lunchbox, tin. Coca Cola mini lunchbox with handle. Mini Lunchbox storage from Coca Cola. The Lone Ranger tin lunchbox for Cheerios. The Lone Ranger advertising tin lunchbox, 2001 for Cheerios. Doggy day pack tin carry container, vintage box. Doggy day pack for dogs on the go. Roman scenery blue embossed tin lidded box made in Holland. Vintage blue tin from Holland embossed with Roman time decorations. Star Wars lunchbox, 2010 Darth Vader. Darth Vader 2010 lunchbox, Star Wars for school, collection, or storage. 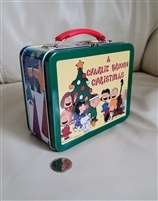 A Charlie Brown Christmas lunchbox tin. Aladdin Industries vintage Minnie Mouse hard plastic lunch box collectible or daily use item. Raggedy Ann and Andy embossed metal lunchbox from 1973. Raggedy Ann and Andy 1973 metal embossed lunch box collectible, display, or daily use.